Régis Bonnessée is a French designer with three previous games which have caught my eye (Seasons, Lords of Xidit and Himalaya). When I heard that he was behind this new game, I was definitely interested. Throw in a game mechanic which has always intrigued me (dice/deck crafting), and this was a must try for me this summer. 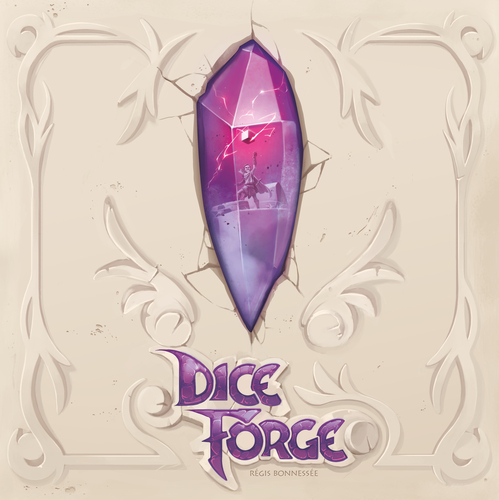 In Dice Forge, players take on the role of aspiring demigods. The players are pitted against each other in a tournament being set up for the Gods enjoyment. The best player will get a chance to become a demigod as a reward. Or at least that’s how the story goes. I’ll admit I didn’t pay much more attention to it because as soon as I saw the customizable dice, I just started to play with them! Be sure to set aside about 20 minutes to set up the game when you first open the box, you will have to sort all the individual dice faces out and place them on the temple board. This board then fits in a sleeve which keeps everything from falling out of place in the box. Every component has its own place in the custom molded insert, and when it’s all put away, everything is nice and tight and nothing should move around in it. The setup of the game is fairly straightforward – but mostly because you are asked to reset the game at the end of the previous game… There are 8 modifiable dice in the game, and each player will get a pair of dice – A “Light” die (which has a flame on one side) and a “Dark” die (which has a moon on one face). These dice are placed on a player board. 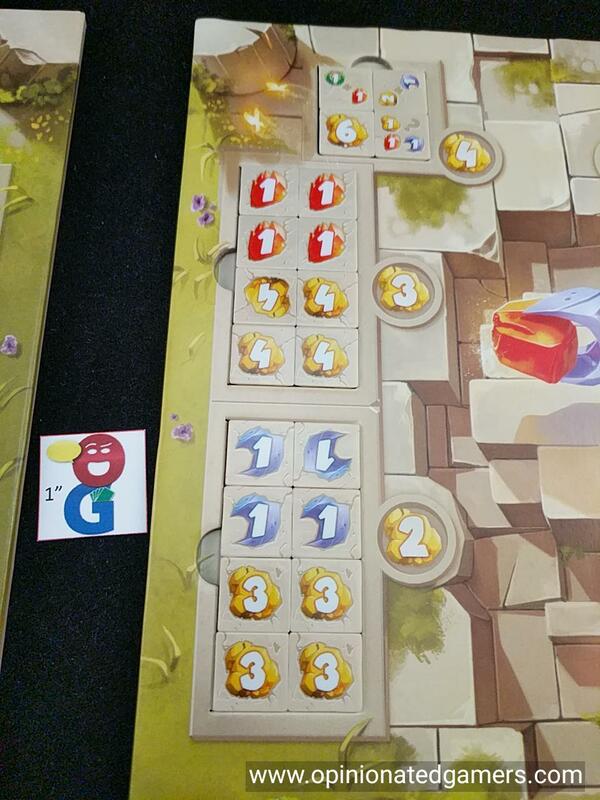 This board also has 5 tracks, and each player has 5 matching colored markers to track progress on these tracks. 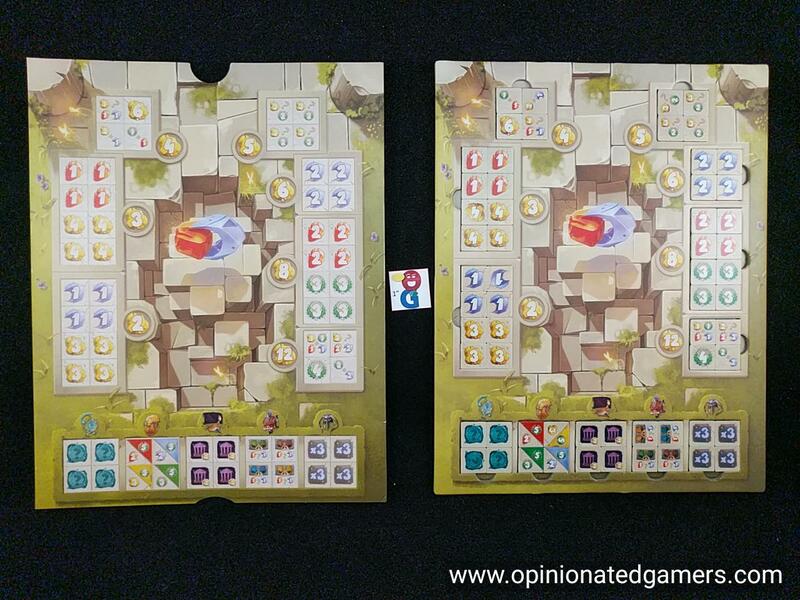 Cleverly enough, when the components are taken out of the box in setup, the now empty box then serves as the base for the Temple board – so that the different die faces are easily available to all players. There is an Islands “board” which is really just a complex cardboard cutout which is placed on the table. 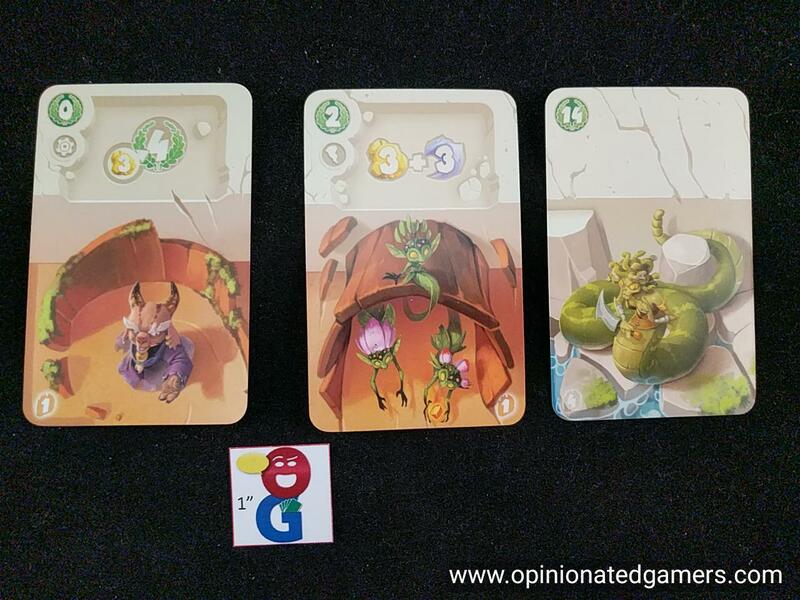 Heroic feat cards with matching costs are placed in their appropriate spaces in this Island board. The game is played over nine rounds (in a 4p game). There are four phases in each round. 1) Receive Divine Blessings – all players (not just the active player) roll both their dice and place them back on their player board with the rolled faces up. The two die faces are then applied in the order of the player’s choice. Generally, this can happen simultaneously. In cases where it matters, take the actions in player order, starting with the active player. 2) Call for reinforcements – if the active player has any cards with reinforcement actions (a gear symbol); these are applied in the order of the player’s choice. Make an offering – Players can take one or more strictly different die faces from the Sanctuary supply. There is a gold cost associated with each area – the player must reduce his gold track by an appropriate amount for each die face purchased. 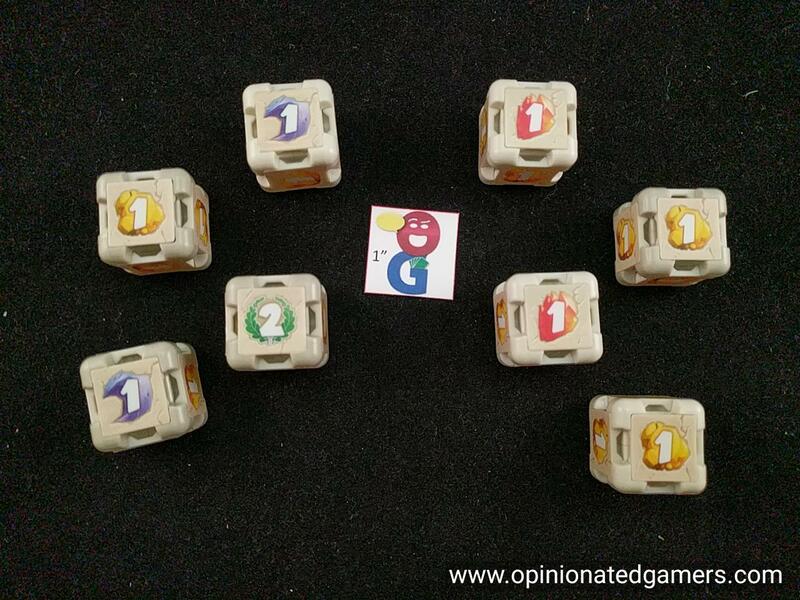 The new faces must immediately be placed on his dice in the order of his choice. The old die faces are placed near that player’s inventory. The newly forged die is placed back on the player board with the new face facing up. Perform a Heroic Feat – Choose one of the Heroic Feat cards to perform and spends the appropriate resources (either red sun shards or blue moon shards). Move your player pawn to the portal of the island where the card is located. If someone is already there, that player is moved to his starting place and also gets a Divine Blessing (roll both dice) as compensation for being displaced. There may be is an immediate effect on the Heroic Feat card, this is now applied. The card is then flipped over and placed in a stack with similar cards near your inventory. 4) Optionally perform an additional action – the player may spend 2 Red Sun Shards to take either another Offering or Heroic Feat (as outlined in step 3 above). At this point, the active player’s turn ends and the next player clockwise becomes the active player and starts with his Phase 1. If the initial Start Player takes another turn, he should remember to move the Round marker forward one space to track the progress of the game. If the final round is complete, scores are tallied to see who is the winner. The player with the most victory points (sum of the points on the player board as well as the points on Heroic Feat cards) wins. There is no tiebreaker. Dice Forge is a fascinating game. The idea of customizable dice or a dice-builder has always intrigued me – for at least ten years now… which is when I first saw the first prototype of Stephen Glenn’s game which eventually became Rattlebones… The physical constraints of the die (given that each one will only have 6 faces) makes this a bit of a different challenge than a deck-builder. Here, you always have twelve sides, and you’ll always roll one face on each die. You don’t have to worry about thinning your deck – that happens automatically as you simply replace one face for another. But, you do have to look at the combinatorics of the faces, making sure that you give yourself the best probability of getting the rolls that you want to happen. You only get 9 turns in the game – and this doesn’t really sound like a lot… And, it isn’t. But it feels like just enough. That is just enough rounds to give you a chance to modify you dice to enact a strategy and then put it into play. The players are engaged on every player’s turn because they are guaranteed at least one roll of the dice at the start of the turn, and they may be asked to do something else later on depending on the actions of the active player. If you’re near the start of turn order, you might want to make sure that you’ve got a few VP producing faces for the last round… once you take your final turn, you’re still in the game to roll your dice, but you generally can’t get anything out of the rolls unless they are VPs. There isn’t a lot of direct interaction in the game. You can’t do much to affect your opponent’s progress other than deny them dice faces – and you can only do this by choosing them first for yourself. There is a bit of interaction as far as displacing an opponent from a card portal, but this only gives the displaced opponent a reward of being able to roll his dice and take resources. There are a few other actions which allow you to reap the rewards of your opponent’s dice; but again, this isn’t harmful to the opponents, so it doesn’t really affect their game much. For me, that’s just fine. I don’t need to have PvP conflict or direct attacking abilities on my opponents; I quite like having my own little sandbox to construct and roll my dice in. So far, in my three games, we have stayed with the recommended starter set of cards. Part of the reason is that we’ve always had at least one person new to the game. The other reason is that I’m still having a lot of fun with this basic set of cards, and I haven’t even felt the need to change things up. This probably bodes well for the long-term success of this game because it leaves plenty of opportunity for different setup variations in the future. The setup of the game also lends itself well to the concept of expansions as it would be dead simple to add new dice faces or Heroic Feat cards to the game as well. The box insert and layout is very nice. The dice face tray and sleeve both help keep things organized in storage. The sleeve can also be used as a handy reference for the players on the far side of the table from the dice. The vac tray underneath has custom made wells/slots for everything else, and it is quite pleasing to watch everything go back into its well-designed space at the end of the game. The dice faces pop in and out easily, and I like the fact that you can use the die face itself as the tool to replace an old one. Very neat indeed. 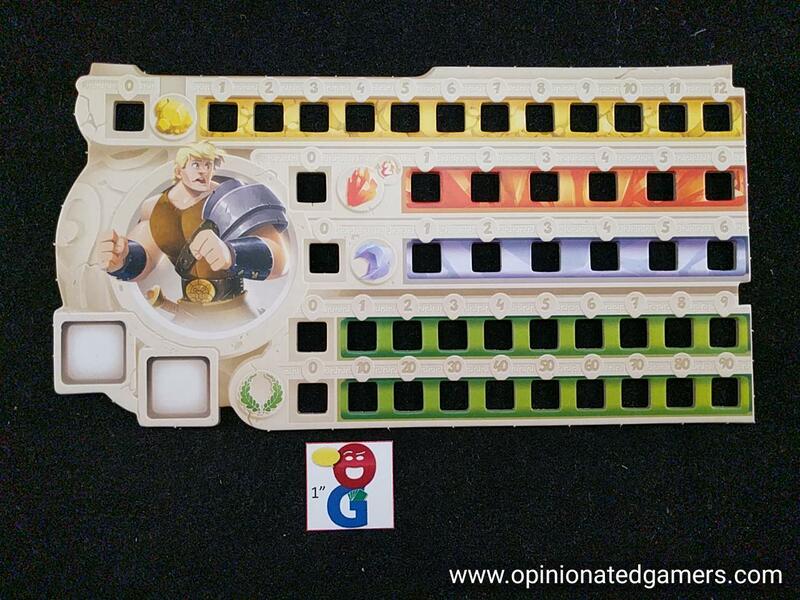 On the whole, this is a well-designed game that gives players many options yet remains accessible to the family market. Games should run 45-60 minutes once people know the rules, and I’ve actually found it quite easy to teach the game by simply setting in up and then running through a practice round or two. 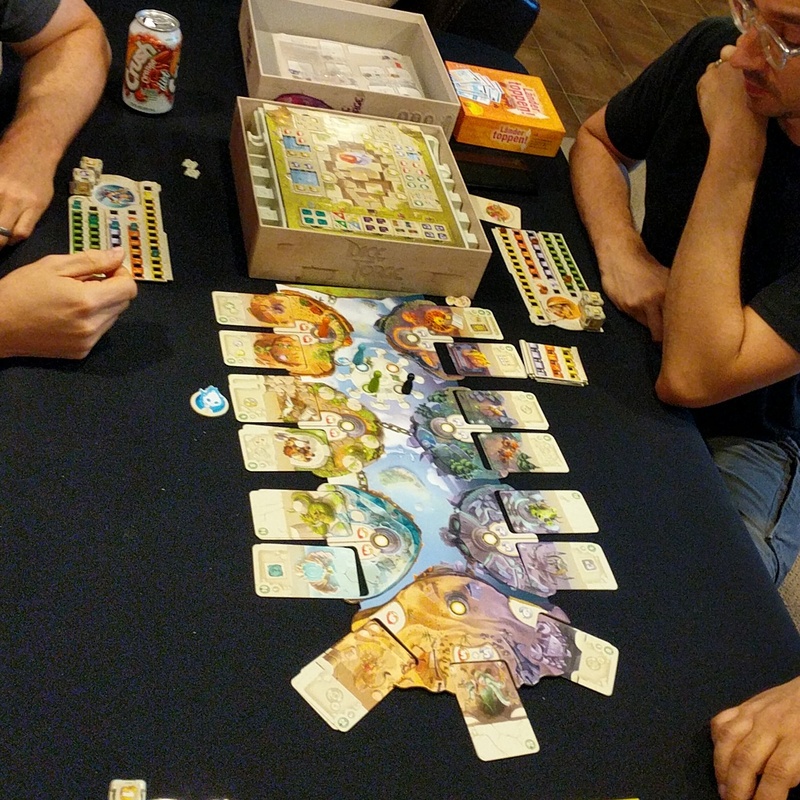 Dice Forge definitely scratches the same itch as Seasons (an earlier game from the same designer) but the actions seem simpler/more elegant and require much fewer rules consultations, and this results in a much more enjoyable gaming experience. Dan Blum (1 play): This all works fine but I am afraid my reaction was “so what?” Well, OK, my first reaction was “better than Rattlebones” (sorry, Stephen), but that was next. The decisions are just not that interesting. I am not convinced that the decisions on which dice faces to get can ever be that interesting, but the cards didn’t add much to it. Possibly the other cards in the game are better (we played with the basic set), and I’d be willing to play the game again to see, but so far I am not particularly impressed. I agree with Dale that this is simpler and faster than Seasons, but Seasons had a lot more going on. Dice Forge actually reminds me more of Colony, except that I like Colony a lot more; this is not entirely because it uses combinations of many dice rather than two dice with changeable faces, but I suspect that the former does in fact allow for more interesting decisions than the latter. Joe Huber (1 play): Dan has summed up my feelings on the game remarkably well. The game works – but while I’ll buy Dale’s assertion that it scratches the same itch as Seasons, I had the good fortunate of discovering calamine lotion long before. The concept of a game focused on changing dice faces remains interesting, but best benefits from them changing regularly. I have yet to play a published design that really meets this goal.